Silverdale Baptist Academy's Maddie Tankersley signed a softball scholarship with Alabama-Huntsville on Wednesday. Tankersley pitched all five Division II-A state tournament games last spring and led the Lady Seahawks to the school's first championship. Silverdale Baptist Academy softball standout Maddie Tankersley, who as a junior pitched all five games in the Lady Seahawks’ drive to the 2018 TSSAA Division II-A state softball championship, will continue her academic and athletic career at NCAA Division II Alabama-Huntsville after signing with the Chargers on Wednesday. 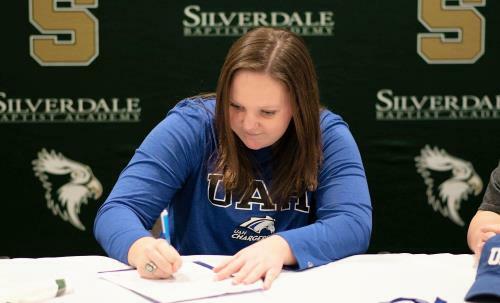 Tankersley, who has played the outfield, first base and pitched for the Lady Seahawks, committed to UA-H last summer and concluded her recruiting process Wednesday with the signing ceremony at SBA’s Silver Room. Last year in the state tournament opener in Murfreesboro, the Lady Seahawks suffered a 9-2 loss against Tipton-Rosemark but rebounded to capture the school’s first state championship, beating Tipton-Rosemark, 3-1 and 6-4. They finished with a 30-8 record. Tankersley set a school record with 27 wins against seven losses. Tankersley pitched all five SBA state tourney games and each was a complete game effort. She threw 33 innings, gave up 32 hits, 19 runs, 14 earned, walked 12 and struck out 31. The right-hander threw 536 pitches, an average of 107.2 per game. “Maddie carried us through the latter part of last season better than most people could have,” SBA coach Tim Couch said. “In the last game, she was one of two players with two hits. Tankersley, 17, did not play high school ball as a sophomore, choosing to concentrate on travel ball and played with the ProStar team, coached by Steve Chattin, out of Dalton. She played with the Chattanooga Force 18-under team coached by Craig Frost this past summer. The has been a long-time student of pitching coach Beth Keylon Rawlston. As a pitcher, Tankersley recorded 178 innings and went 27-7 in the team’s championship campaign. She struck out 251 batters, walked 54, allowed 106 hits and posted a 1.41 ERA. She went 42 for 102 at the plate (.412 batting average), including six doubles, and drove in 32 runs and scored eight times. On the mound, Tankersley’s strikeout total was 10 shy of the school single-season record 261 held by Katie Henderson, who signed with Kentucky but transferred to Tennessee-Chattanooga after one year in Lexington. Tankersley was selected as the Division II District 2 Pitcher of the Year and an all-district first team pick. At UA-H, Tankersley will play for coach Lorraine “Les” Stuedeman, the first and only Chargers’ coach in a program started in 1995. Stuedeman, a NFCA Hall of Fame inductee (2014) has averaged 46 wins per season and went to the Super Regionals this past season. The Charges have appeared in 21 NCAA tournaments, including 16 straight. UA-H competes in the Gulf South Conference and Stuedeman has been named that league’s coach of the year 10 times. Stuedeman has a 1,055-346-1 record that includes 52-9 and 54-6 marks in 2008 and 2009 seasons. She went 62-12 in 1999. Couch believes UA-H is getting a stellar pitching prospect in his start performer in the circle. “Absolutely,” he said. “Pitching is what got her the attention, although she’s capable of playing other positons. She’s joining a quality program; it’s no joke. She’ll have to compete for pitching time but she’s never backed away from that before.